Neighboring onsite pool & hot tub. Cliffside patio. Cliffside patio. Ground level. Easy access to river & pool. Patio overlooking natural rock wall. Just 5 minute walk to town. 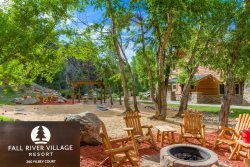 Cliffside condo by fire pits, gas grills & Estes Park riverwalk. Spacious cliffside King & Queen condo. Near pool & hot tub. Cliffside condo by onsite hot tub. Dog-friendly. Ground level. Spacious cliffside condo. Near hot tubs & gas grills. Upper level. Close to town. Cliffside condo with balcony. 2 queen bedrooms. Cliffside King & Queen condo. Mountain views. Jetted tub. Balcony with grill. Ceiling fans. 2 queen bedrooms.